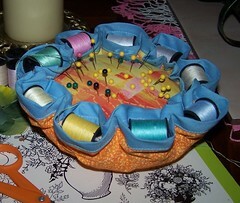 Posted on February 2, 2007	by Linda S.
It’s a thread holder pincushion that is as close as I can remember to the one that my mom made for me for Christmas about 40 years ago. It sure comes in handy when you are doing applique or anything else that requires frequent changes in the color of thread used. Very easy and quick to make. 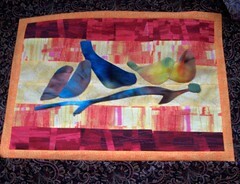 This entry was posted in Crafts, Embroidery, Handcraft, Handwork, Needlework, Quilt, Sewing. Bookmark the permalink.